If middle grade e-books are the next big thing, Rick Daley is right on time. 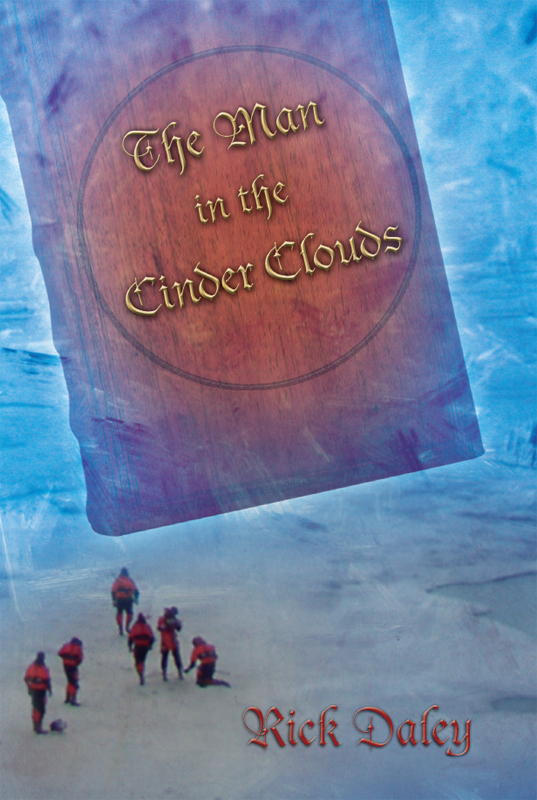 The Man in the Cinder Clouds, Rick Daley’s delightful Christmas Tale, is a story within a story within a story. I love how Rick weaves these three plots together, each dependent on the other, nested like Christmas Dolls. In the first, we follow Jason to the North Pole where his father’s scientific team is drilling for ice cores (go science! Points for arctic coolness here). Instead they find a magical book that tells the second tale, of one Kris Kringle before he was the chief bringer of gifts. Kris’ search to find his true family and proof of human virtue leads us to the third tale, the story of Aaron and Alice, two orphaned children struggling to survive in a long-ago time when life wasn’t easy for anyone, especially children dependent on nasty uncles trying to rob them of their inheritance. The three stories twist and turn together, bringing modern and ancient adventures together with a splash of magic and the wonder of Christmas in this completely fresh take on the story of Santa Claus. There is some peril of main characters in the book, so I wouldn’t recommend The Man in the Cinder Clouds for the very young, but it makes a great Christmas read for readers age 7+. Full disclosure: I was a critique partner for Rick during the early stages of this story. As many of you know, critique partners get an glimpse of wonderful stories before they are published and have the special privilege of helping to make them a bit better. We also get to be the first fans. From my first read of The Man in the Cinder Clouds, I knew this was a story that needed to see print. I’m so glad that Rick decided to self-publish and share his Christmas Story with children and adults alike! The Man in the Cinder Clouds is available in print and e-book from Amazon.com and BarnesandNoble.com. You can also find it on Facebook and Goodreads. Just leave a comment below today or tomorrow – winner will be announced on Wednesday, when we will have an interview with Rick, and more about his path to publication. Stop back then! Sue, thank you so much for the kind words, I appreciate your feedback and support! I love the idea of stories nested within stories! The cover is beautiful too. Eager to here more about this. The cover was designed by CreateSpace. I agree, they did a great job. That was one of the decisions I faced with self-publishing: try to design a cover myself, or fork over some $$ and have one done professionally. I provided CreateSpace with some general images I found on iStockphoto, plus a drawing I made. They gave me two options. I picked one to move forward with and provided some feedback. They sent a revision, then some more feedback and one more revision and we were all set! That's so cool! Awesome cover! And stories within stories? What an AMAZING idea! LTM- I really hope you have the chance to read it, and that you enjoy it. Thanks for commenting! I kind of wonder how much of the market ebooks have when it comes to middle grade as opposed to adult. My guess is that it is pretty small. This does sound interesting though and I may have to take a look at it, if not for myself, then perhaps for a younger fellow that might enjoy a read. @Michael I hope you'll pass it on to a kid – I'm sure they'll like it! As far as e-books for middle graders, there's lots of whispering that this Christmas could see a shift on that (for now, you are right though – most adult e-books). More on that here. I've wondered about audio books for kids. Many of them already have hand-held gaming devices that can handle MP3 and other audio formats, and that have wireless connectivity to stores (at least, those that haven't been hacked). The challenge will be getting kids a reading device that's not also a gaming system, or if it is a dual-op device, finding ways to get the kids to read instead of play. Heck, I bet many adults struggle with their iPads in that manner! Michael- If you have a chance, give it a read. While it is primarily a book for kids, the story has enough complexity to it (and action / peril) to keep an adult entertained too. And Rick's story sounds awesome, which doesn't surprise me at all. I mean Bryan. With a Y. At least I didn't say Brain. I'm very curious to see how kids and e-readers go together. Kids are no stranger to technology, and I hope the younger generations gets an e-reader they can embrace in the near future, before books get lost in the multitude of apps. I'm glad you find the premise interesting, hopefully you will have an opportunity to read the story and see if the intrigue carries through the pages. Yay, for Rick. The story sounds very cool (no pun intended). I'm so glad you gave it an e-life. Hey, I only found this because google+ notified me this morning it was available, and you were one of the group it showed me. Woo-hoo! Yup,I want that book because my writing has layers, puns the kids might not get but their parents should, and the first book sets up the story in book 2, 3, etc. – if I ever get Erth Won published. Books I read end up in the 7th grade classes I visit. Fingers crossed! And now I see this post was dated last month. Why did google+ think it was new? Oh well. Uncrossing fingers. Sher- Better late than never! The give-away is over, but there's still plenty of time to get a copy before Christmas, maybe Google+ was just pacing itself. I hope you have a chance to read my story, it sounds like there are many points to the style that you may appreciate. Thanks for stopping by and commenting!